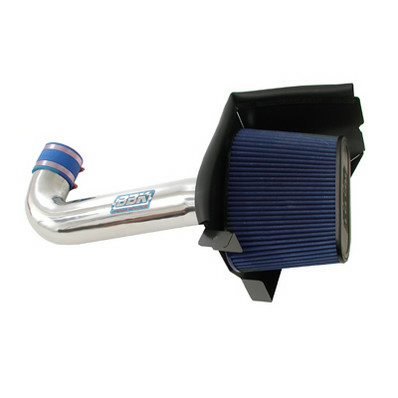 * Chrome Finish Owners of the latest generation of 03-08 Dodge Ram 5.7L trucks now can own this great looking Chrome Cold Air Intake kit - Hemi V-8 5.7L Dodge Ram trucks can add up to 21 hp with one of the BBK's latest cold air induction systems. Designed as a direct replacement, it is a simple bolt on to any 03-08 Ram truck with the Hemi 5.7L engine. As with all BBK cold air intake systems the high flow cotton element filter is a washable unit that will last the life of your vehicle. This system features a show quality chrome plated inlet elbow with a black powder coated finished shroud for excellent looks. Get the most out of your favorite Dodge truck with this great performance cold air kit from BBK Performance. Click Here for Instructions No one else can Stack up to the bold clean styling of our aftermarket Billet / Stainless Steel Dress Ups, Street / Strip / Racing Suspension and Performance Parts for your American Muscle Car! Fits these Vehicles: 2003 2004 2005 2006 2007 2008 Dodge Ram 5.7L Truck.